I am torn in thinking about keep-the-bastards-honest, a-pox-on-both-their-houses anti-politicians and minor parties because there’s no doubt that sometimes some of them can be useful – like when they’re blocking Tony Abbott. Actually, it’s not fair to just say useful. Sometimes they’re entirely heroic and progressive policies wouldn’t be implemented or saved from repeal without them. But just as often, they’re unpredictable, flimsy, self-centred, untrustworthy, and politically motivated to differentiate themselves from major parties for their own vested interests and ideological purity. Yet they claim to be above all this when painting themselves as ‘not like the baddies in the majors’. But most are just as grubby as the spin doctors in the major parties when it comes to election tactics. Otherwise they’d never get elected in the first place. Don’t forget that independents and minor parties rely on convoluted preference deals to get into power, deals which are by their very nature political. Once in parliament they have to do deals – otherwise they’d be both invisible and irrelevant. 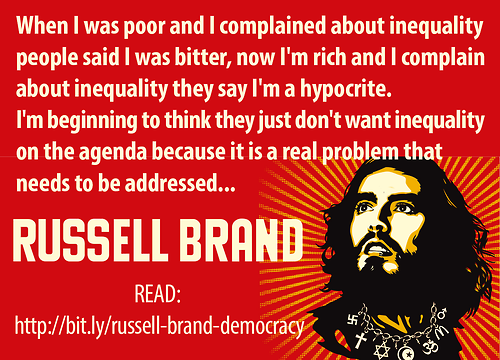 A great example of these mixed feelings is my current love-hate relationship with Russell Brand. I guess it’s not really fair to say hate, because I don’t feel the same way about Brand as I do about Abbott. Let’s just say love and frustration. I really respect Brand’s moral stance on the danger of growing wealth inequality. His possible bid to become London’s Lord Mayor is probably inspired by his campaign to reduce unaffordability of housing in London, where he grew up on a council estate. Helen Razor suggests that if Brand wants to be a politician, he should learn a thing or two about economics. But to be fair, when he says he can’t get his head around economics, he may be joking, or he may be making the very fair assessment that current orthodoxies about supply and demand economics are a function of a capitalist system that favours the very few over the rest of us. In that, Brand definitely has a point. Brand is not just any celebrity who decides to talk about politics – he is eloquent, intelligent, passionate, knows his stuff, and is incredibly charismatic – all great qualities of a leader (or politician if you want to call a spade a spade). And his values align very closely with mine. On top of this, he promoted Australia’s March in March to his 8 million twitter followers. Also, his YouTube show The Trews is truly hilarious. So I’ve covered the things I love, but now what about the frustration? Really it all boils down to Brand’s anti-politician strategy of differentiating himself from mainstream politicians by calling for a revolution and encouraging people who value his opinions not to vote. When I first heard this, I was intrigued. The conspiracy theorist in me wondered for a moment if he was being paid by the Conservative Party to get young progressive voters off the electoral role. And even though I’ve since become a huge fan of Brand, I still can’t see how he can’t see that it’s an incredibly counterproductive action to urge support for progressive policies by telling progressive voters not to vote. I’m sure the Conservative Party are happy that they didn’t have to pay Brand to mount this campaign. Perhaps a year on, Brand is shifting away from this statement by considering running himself for Mayor – it’s hard to get people to vote for you when you’ve told them that voting at all makes you part of the problem. However, the trait that Brand shares with many anti-politicians and minor parties is that he wants everything to happen now, through revolution, and ignores the reality that progressive policy reforms are never an overnight change inspired by a single person or a small group. Brand’s impatience makes him in the UK context just as anti-Labour as he is anti-Conservative – he heaps them together into the ‘they’re all the same’ type statements, which ends up benefiting the Conservatives. Why does this statement benefit the Conservatives? Because if they’re just as bad as each other, people may as well vote for Cameron, or in our case, Abbott. If there’s no difference in the result. Reality is, progressive reforms come about through long, hard-fought series of carefully negotiated and compromised battles to inch forward away from the right-wing ideal of letting the market rip (unregulated neoliberalism) and keeping women barefoot in the kitchen (social conservatism). I’ve quoted Judt before on this blog and I’ll quote him again: ‘incremental improvements upon unsatisfactory circumstances are the best we can hope for’. The ideal of a revolution – a complete replacement of the status quo – as compared to steady and incremental gains in the right direction aren’t two options that you have to choose between. One is a fantasy, the other is achievable. The real option is a choice between the two major parties – one progressive and one conservative. I support the party which aligns most closely with my progressive values, and has the best chance of forming progressive government. As a Port Adelaide supporter, I’ll remind you of the famous Port Adelaide line – we exist to win premierships. The Labor Party doesn’t exist to be activists, or to be ideologically fundamental or to promise a complete overhaul of the status quo. Nor do they expect every progressive voter will agree with everything they do. The Labor Party exists to form government that can improve the lives of Australians through progressive reforms. And they need progressive Australians help them to do this. Very good article Vic and thanks again. Well it wont be voting for Clive Palmer and his four village idiot dumb-sculls as there wouldn’t be a brain among them, that is for sure. Then there is this L-NP federal government who hates all unionists and wants to get rid of them anyway they can. Even if they have to help close down all industry here in Australia and replace all manufactured goods and shackles with imported cheap junk and are the biggest liars ever in the history of Australian politics. Long live Labor the working class blue collar advocate against serfdom. Victoria, I wholeheartedly agree what we need are politicians who have the guts and vision like Whitlam had, to do the right thing bt the people instead of against the people.